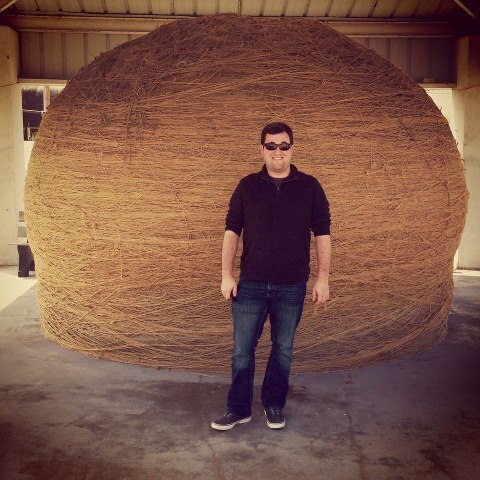 Rep. Brett Hildabrand poses in front of the world's largest ball of twine in Cawker City, Kan. Why? I have no idea. As the Kansas Legislature visits big balls of twine over spring recess, this much is clear: The Senate is preparing to stab hard working Kansans in the back. The Legislature left Topeka without hammering out details of next year's budget. They'll do those in the waning days of the session. As our Kansas All-Stars have traveled around the state making nice with constituents, it's becoming increasingly clear that the Senate, assisted (ordered?) by Gov. Sam Brownback, is hellbent on a budget that does not allow a portion of the 1-cent sales tax, set to expire this year, to sunset. Fast forward to 2012, in which the Legislature lowered state income tax rates. Unfortunately, they lowered the rates without quite knowing how they would make up for projected budget shortfalls. I'm completely OK with that. What I'm NOT OK with is that now members of the Senate and the Governor intend to make up the gap by breaking a promise. I recognize that many of the lawmakers who struck the Great Sales Tax Increase Compromise of 2010 have since been replaced. (There's probably a lesson there, but I'll let you all figure it out for yourselves.) That shouldn't matter. Morally, I believe current lawmakers are bound to that very specific promise made to Kansans in 2010. And here in Kansas, we care about morals, right? I know I do. Members of the House are offering a different budget plan -- one that keeps the promise legislators made in 2010. It includes various cuts that the Senate seems unwilling to make. In addition to Democrats (and RINOs and naysayers or whoever) being able to say that Kansas Republicans broke a promise to Kansans, they'll also be able to say that the Governor and Senate's plans for the state budget places the burden for making up the shortfall on the lowest earners in the state. This is simple math. The Governor's plan calls for lowering the highest income tax bracket. It's a tax break that lowest income Kansans will not see. Meanwhile, the lowest earners are hit hardest by sales tax increases, which the sales tax extension would be. In general, consumption taxes, or sales taxes, make so much more sense than taxes on earnings. I get it. I really do. But I place a much higher value on keeping your word. It's really that simple. Any member of the Kansas Legislature who votes to extend the sales tax should be fired in 2014.